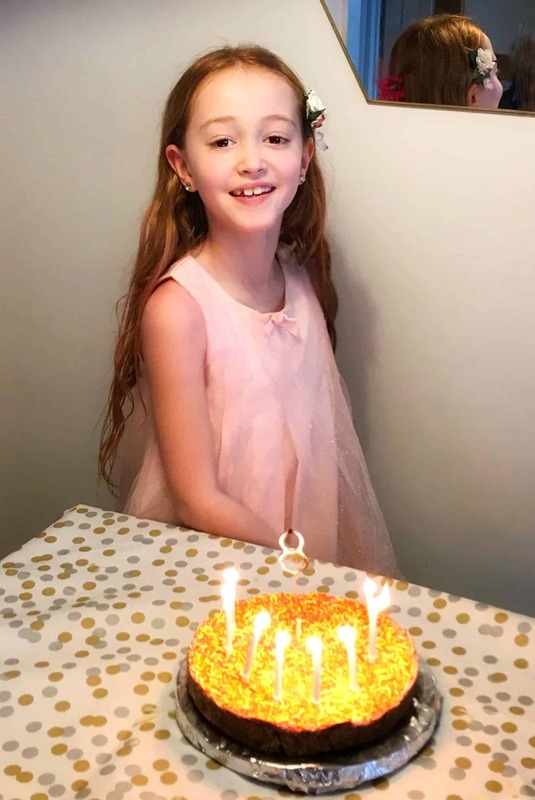 Ava is eight! It’s hard to believe that this time eight years ago, Ryan and I were sitting at home with a teeny baby, in shock that we were actually parents! 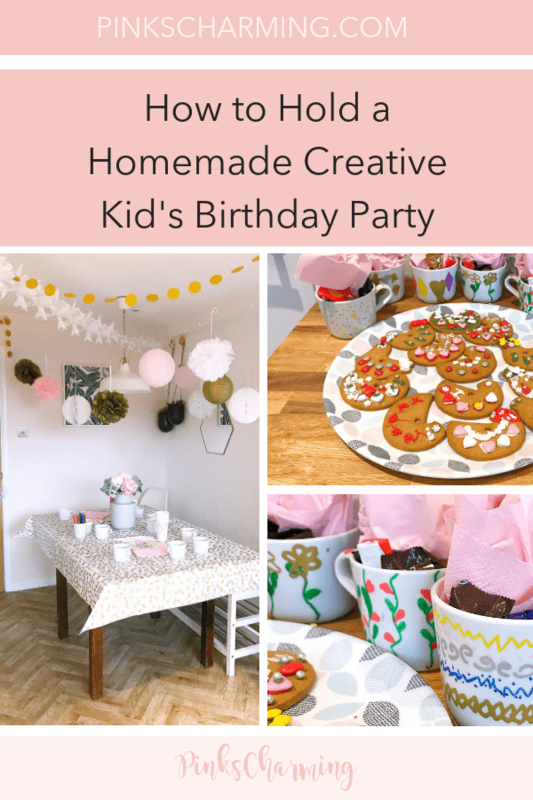 This year we opted for a kid-friendly homemade creative birthday party, as she is a really creative kid. 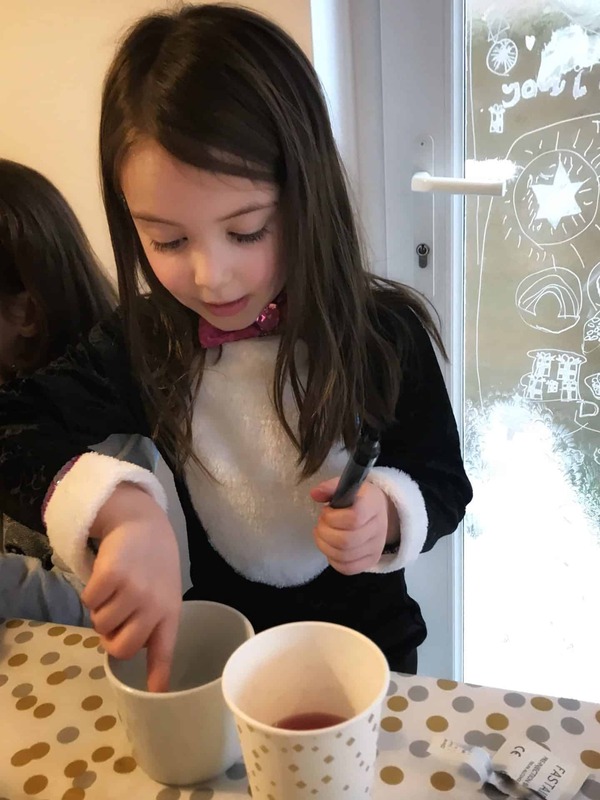 We arranged mug decorating, biscuit decorating and pizza making with her best girlfriends. In fact, this is the first year she hasn’t put any boys on her invite list. A sign of things to come, I guess. 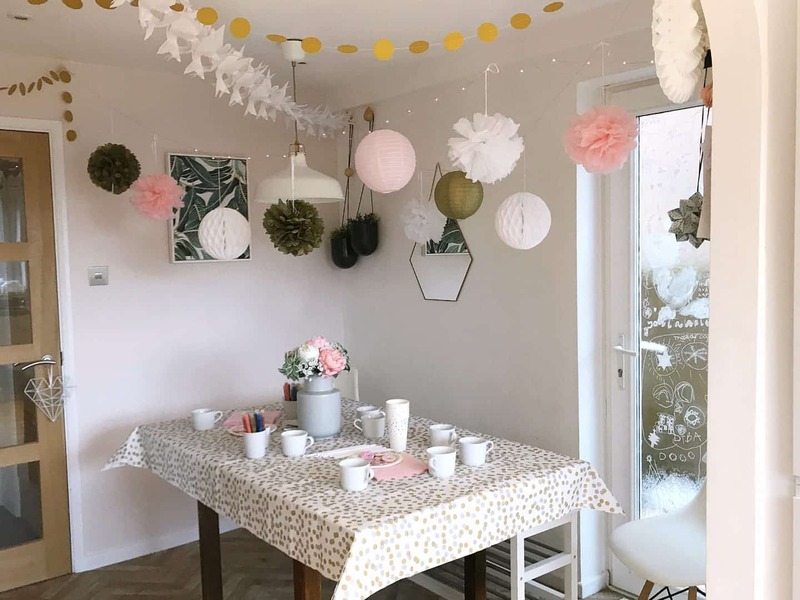 I spent a long time decorating our dining room for Ava’s homemade creative birthday party, and thought it looked lovely. Luckily she agreed! 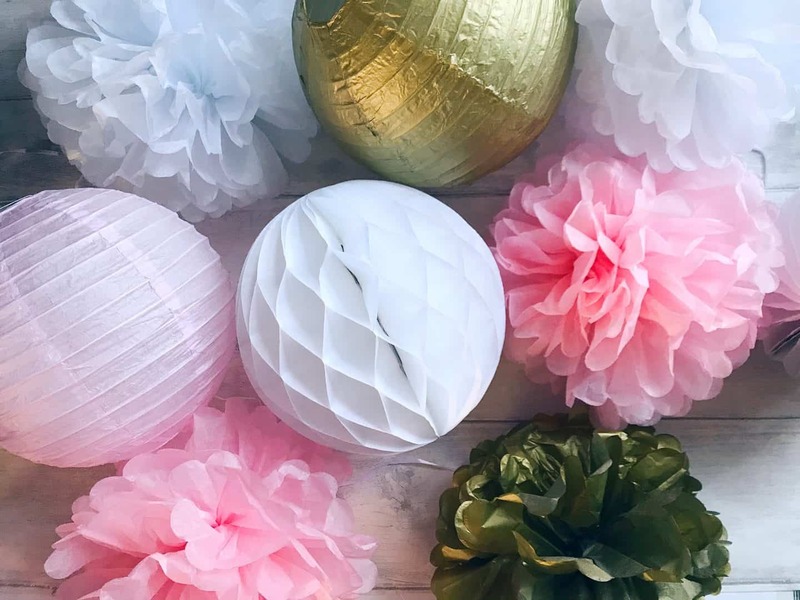 Ava’s party decorations were a mix of pale pink, white and metallic. 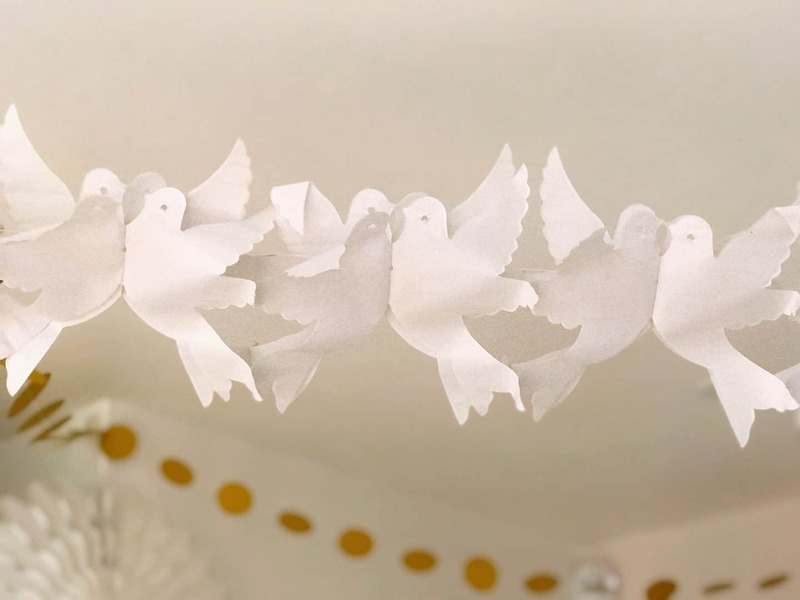 They are from Ikea, Asda and Amazon, and I added a few paper snowflakes and birds which we already had. 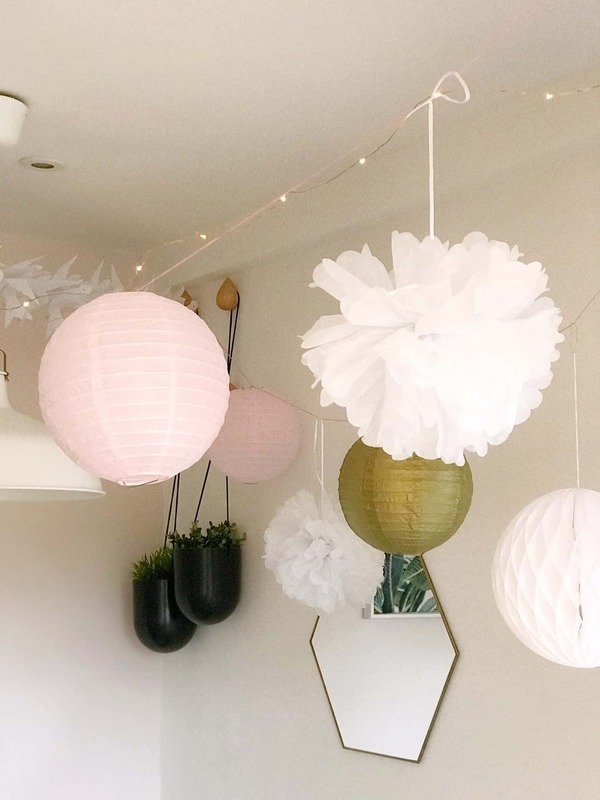 I was particularly pleased with the pack of paper lanterns, paper pompoms and honeycomb balls I got for £12.99 for 12 (affiliate link). The gold paper circle bunting was £6.98 (affiliate link). They will be staying up for Christmas! I also strung some copper string lights across one of the pieces of wool, to add a little sparkle. 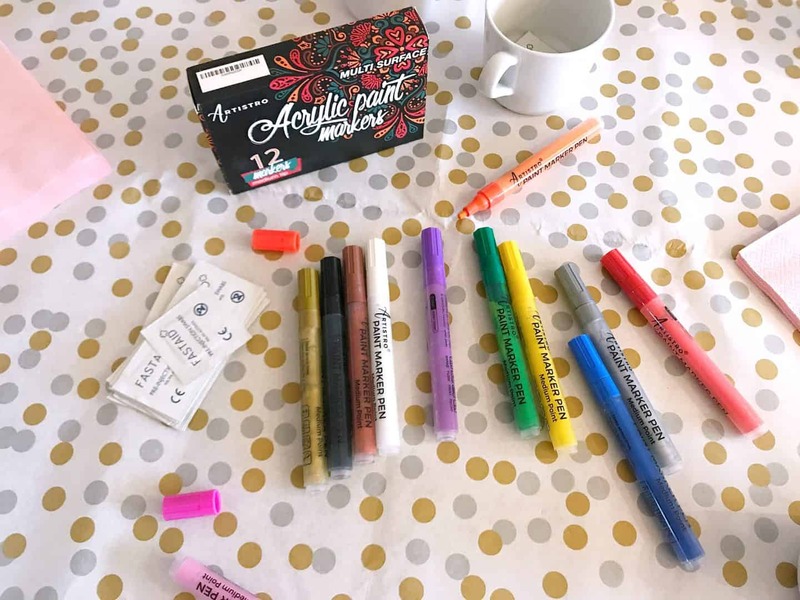 – Paint pens (mine were Artistro Pens, 12 for £12.99 through this affiliate link. )I got two packs as I knew they would all want the same colours at the same time. Wipe each mug over with a surgical wipe to ensure there is no dirt or grease on it. It will dry straight away as the alcohol evaporates (you might want to do this yourself if you have kids round like we did). Prime the pens by shaking them up, and then pressing the nib down onto some scrap paper until the paint flows. 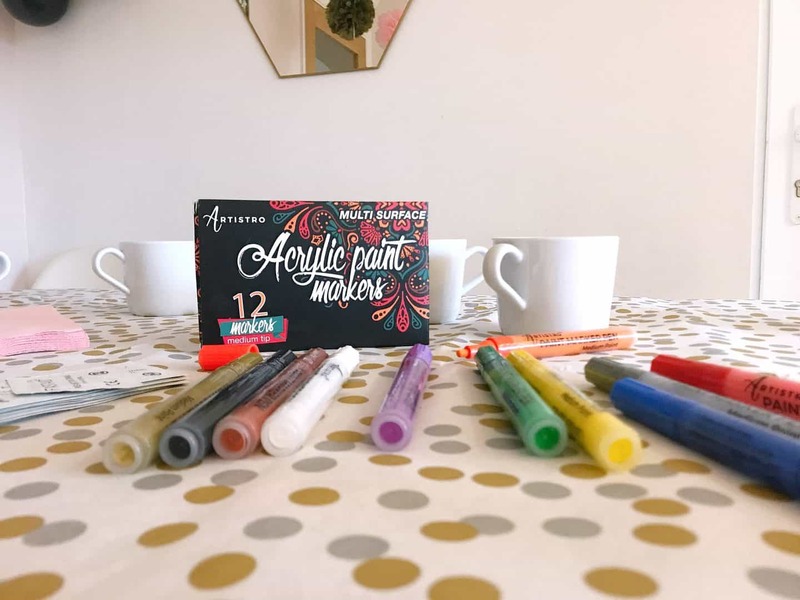 Get artistic and decorate your mugs! Don’t worry about making a mistake, if you do, just wipe the paint off with another wipe or kitchen roll. When you’re happy with your design, let it dry for 24 hours, then bake in the oven to make it set. The mugs will be fine to hand wash, but are not dishwasher safe. Here are my girls decorating their cups. Ava wore her party dress. Thea wore her cat outfit, obvs. 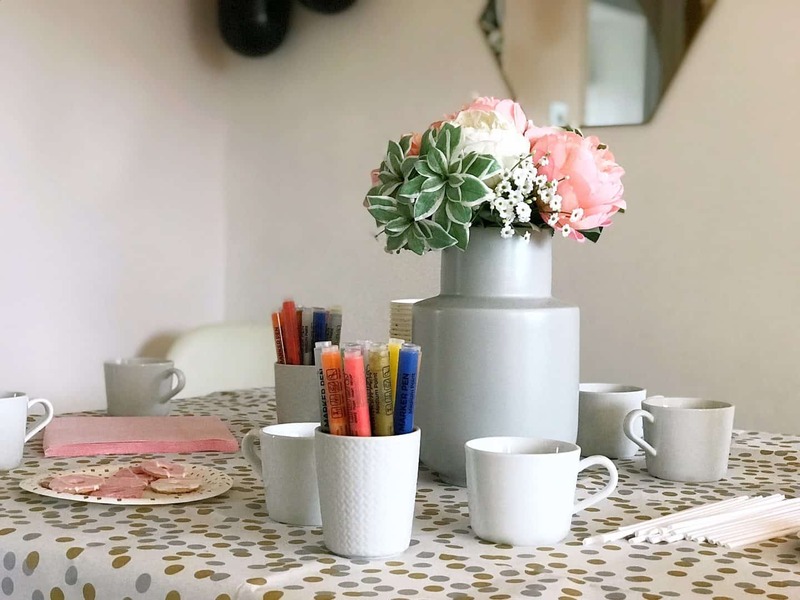 I thought the kids would finish their mugs in a few minutes, but they really took their time and made great designs, scroll down to see them! 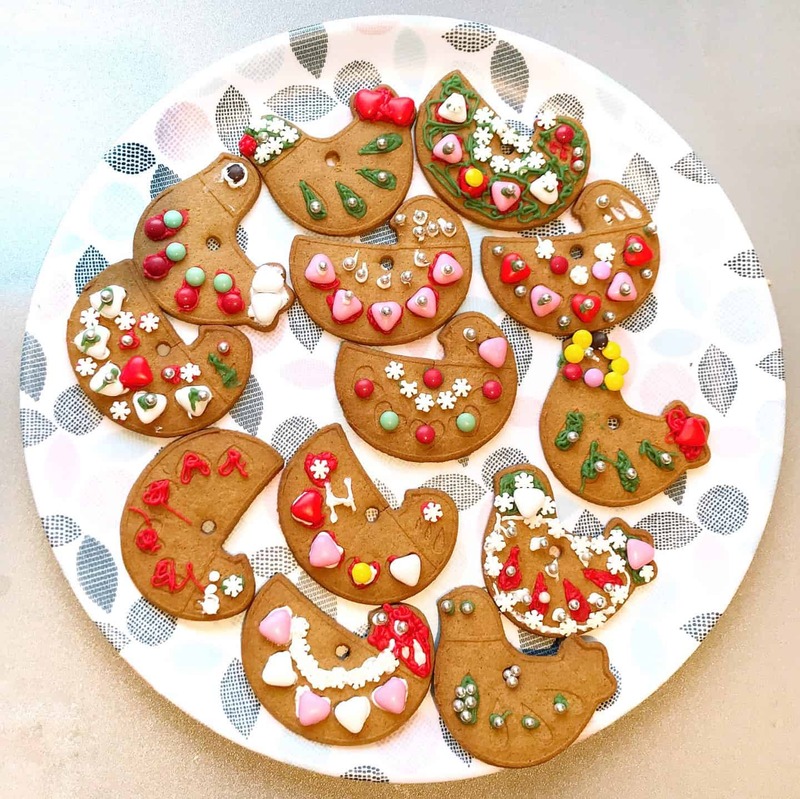 Next the girls decorated gingerbread biscuits from Ikea. I bought two packs of bird biscuits for £1.50 each, and two decorating sets of icing and sprinkles. They come with white, red and green icing, coloured sweets and sugar snowflakes. I also got some candy hearts from Tiger, and some silver balls. You could get the plain biscuits from Ikea, they are so delicious and crisp, and great value. But they are plain, and I thought it would help the kids to have the versions with the hearts and feathers imprinted. 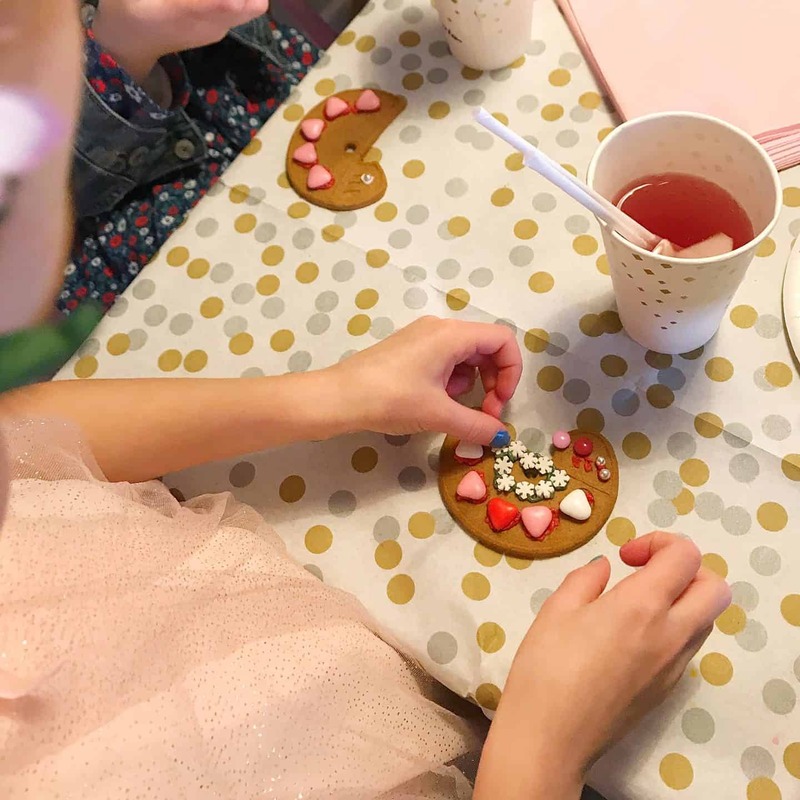 The girls decorated their biscuits beautifully, and some needed a little help with the icing as it’s quite stiff to get out. 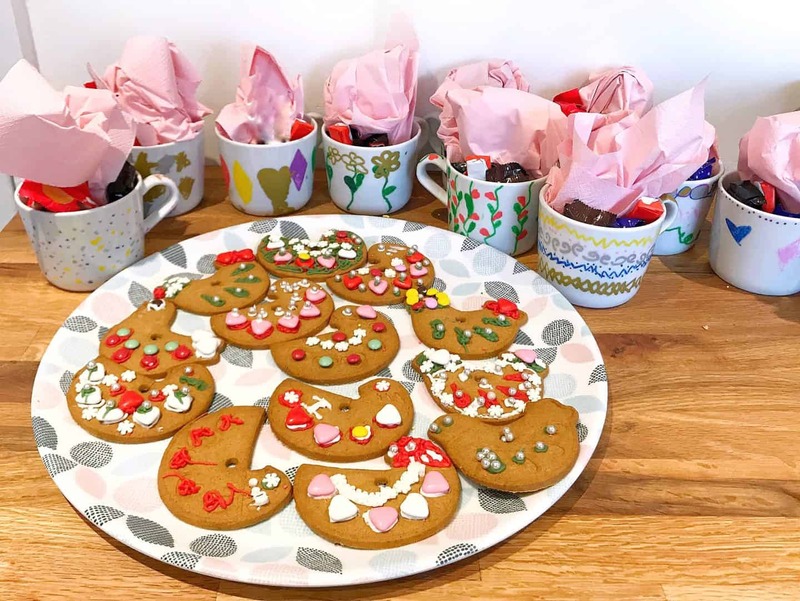 Here are the finished mugs and biscuits, aren’t they amazing? What a creative bunch of kids! 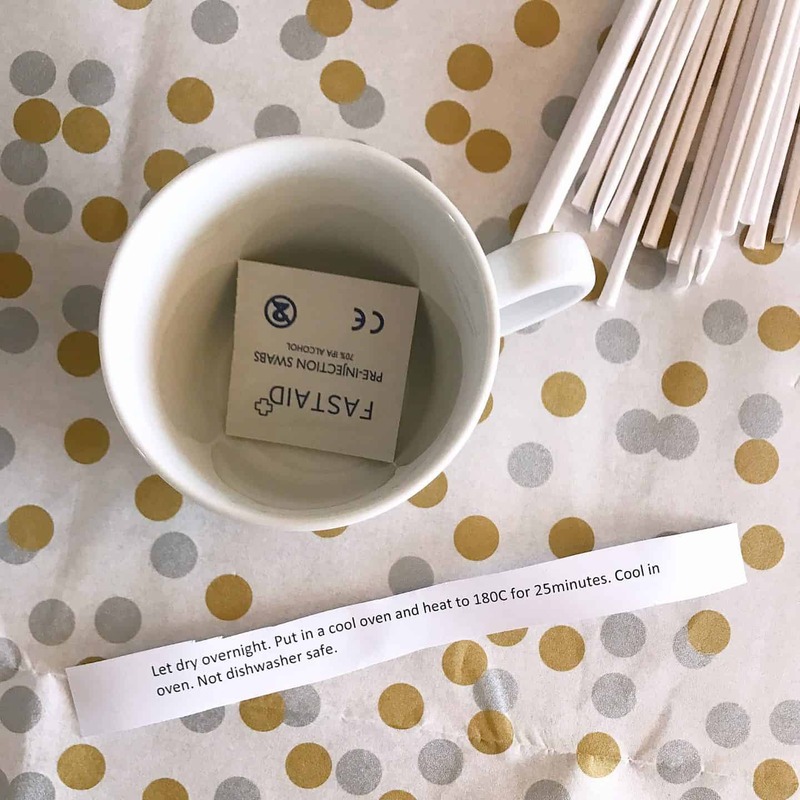 We printed out baking instructions for the mugs, and added them to the cup, and popped in some sweets and a slice of cake instead of normal party bags. This was the part I was nervous about! We decided to give them pizza bases to decorate for their lunch. We used Lo-Dough for our pizza bases. 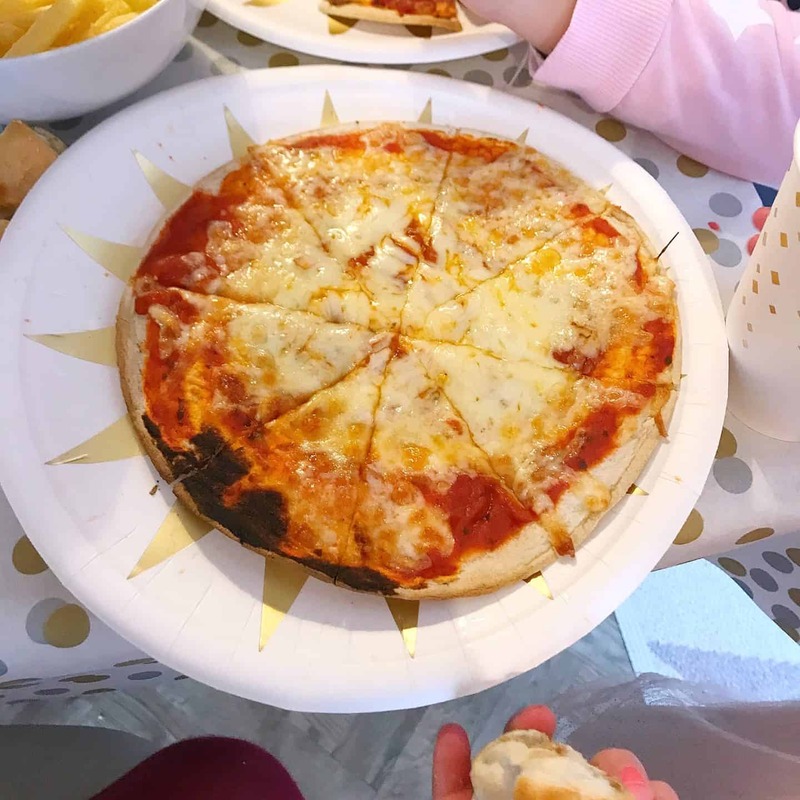 They are the perfect size for a kids pizza and can be used straight out of the packet. We just spread pasta sauce on each base, and let the girls add their own toppings. It was a bit of a juggling act getting them all in the oven, and I’m not 100% sure they each got their own pizza, but they all enjoyed it! They didn’t even complain about the singed part! Ava requested a Chocolate Mud Cake, which is crushed up biscuits, with melted butter and Cadbury’s Cocoa, pressed into a tin and cooled. Then melted Cadbury’s chocolate spread over the top, and I added some neon pink and yellow sprinkles I got when I was in Nashville a few months back. It was a hit, and so quick and easy to make. 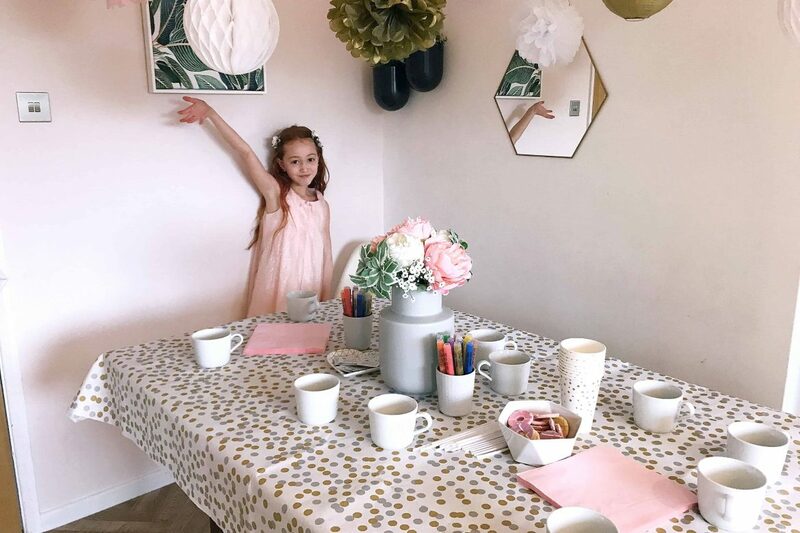 So Ava loved her creative birthday party and was in her element. Amazingly there was no pen anywhere but the paper tablecloth, and the only spillage was my own daughter! I would definitely do this kind of kids creative party again, it worked very well, thanks to quite a lot of planning. Would you hold this kind of party, or do you prefer to have someone organise it for you? We have gone down that route before, which was equally good fun but a lot more expensive. Ava had a fab bowling party a few years back, and went to Splash Zone last year. 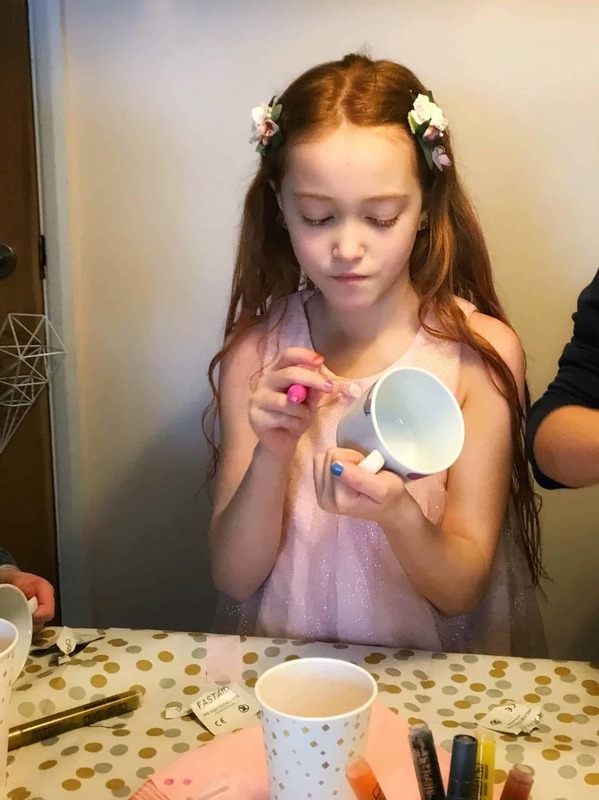 Thea had a pottery painting party a couple of years back, and we have had parties in village halls too, which are great fun but a lot of work! 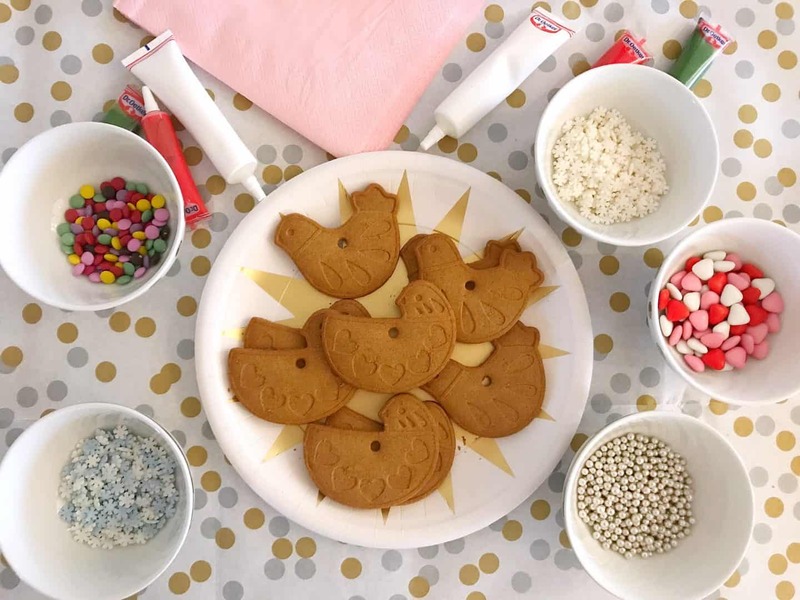 Why not Pin this guide to holding a homemade creative kids party for later?